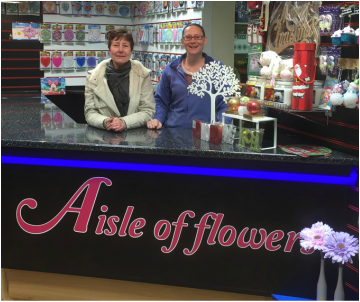 Aisle of Flowers, a family owned florist based in Wednesbury, West Midlands was established in 2006 by owner and head florist Lynsey Hill, offering a wide range of flowers, accomodating for weddings, funerals and all special occasions. Our mission is to supply our customers with the best floral arrangements, above expectation. All our arrangements are tailored to your needs and requirements. We offer both traditional and modern styles of floristry and welcome all new ideas. We also offer a delivery service to all our clients for all orders. In addition Aisle of Flowers offers balloon arrangements and handcrafted cards and invitations for any occasions. Phone enquires are welcome at any time, just give us a call and we will be happy to help. We take all major credit cards (Excluding American Express) in store.